This page contains information you will find useful as a candidate in the Leadership Elections 2019. It is a useful resource during and after the elections and you're strongly encouraged to read before running. Everyone standing for a position will be required to indicate that they have read the rules of the election before being allowed to participate. If you have any questions, please contact the Elections Team. 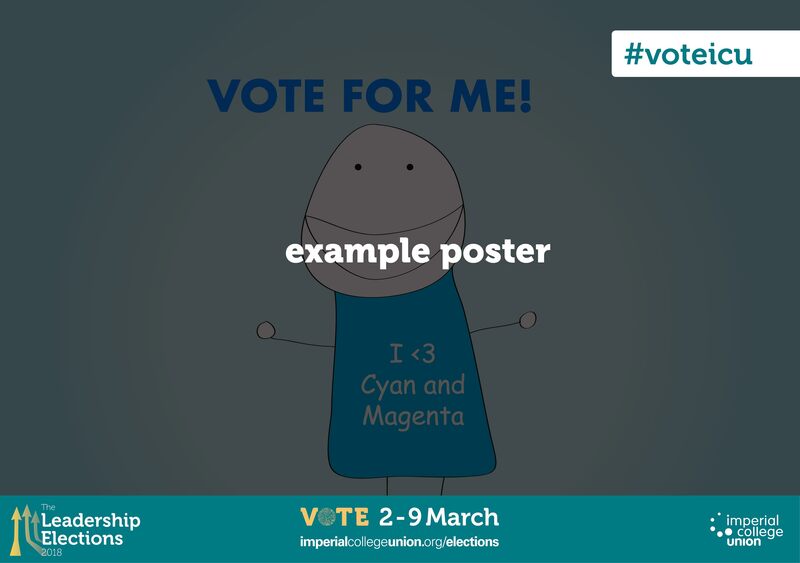 Imperial College Union's elections are governed by rules that ensure fairness and accessibility while rewarding energy and enthusiasm. By nominating yourself for a role, you agree that you have read and understood all of the relevant rules and policies. The rules of the elections will be interpreted and enforced by the Returning Officer (RO) and Deputy Returning Officers (DROs). The DRO reports updates candidates on the latest DRO rulings and interpretations of the elections rules. Imperial College Union offers comprehensive training for elected representatives with tailored programmes for different positions. Officer Trustees (President and four Deputy Presidents) will have a two week induction in July just before assuming their new roles, receive a comprehensive handover from their predecessors, as well as attend a residential as part of their induction to the Board of Trustees. The Felix Editor and Constituent Union leaders will also benefit from an induction programme as well as support from their predessors. We will contact successful candidates with details of induction and or training sessions. We ask that all elected representatives attend training in order to understand Imperial College Union, meet fellow leaders, and learn how to be successful in their role. As well as role-specific training, Imperial College Union also offers skills-based training, supporting our volunteers to develop skills such as public speaking, volunteer leadership, and time management. The following training support will be available during the Nominations period to help you with your candidacy. The Union's Training Hub provides an opportunity for you to learn at your own convenience. There will be material available on the Hub during the elections which are specifically designed to help you with your candidacy. This will help you prepare your manifesto with information on how to craft your platform, as well as tips on language and persuasion. This course will equip you with the tools to craft a campaign that reaches as many of your peers as possible with tips to help you connect with the whole Imperial community. These sessions are designed to provide support to candidates who may have questions or need further support after accessing the training material available on the Training Hub. Sessions will be held at the Union Building in South Kensington. Further details will be provided. All candidates are required to read the rules of the elections before standing for a position. A Candidates' Brief will also be held just before the start of campaigning and all candidates for major positions are strongly encouraged to attend. There are very strict sanctions for breaching the election rules, many of which may not be obvious to candidates. Attending a session gives you the opportunity to ask questions, clarify rules and get useful information about the elections. Remember, ignorance of the rules is not a defence against breaches and sanctions will be applied to anyone who breaks them. the aim is to run a free and fair election that is as stress free as possible to all involved. If you are running for a role that is not a CSP Committee position and you are not able to attend the briefing, please let the Deputy Returning Officers know at elections@imperial.ac.uk. Elections is a stressful time and you will invest a lot of time and emotion into your campaigns, but the most important thing is to look after yourself! Remember to take time out, eat, sleep and be kind to yourself! If you ever feel overwhelmed by the Elections, make sure you talk to someone! Your Deputy President Welfare and the Advice Centre are always here to help. Enterprise Lab 13:45 – 17:00: Watch the final countdown with tea, cake and staff support. Drop in anytime while open and take a load off. The Leadership Elections 2019 are governed by a Returning Officer, who is responsible for ensuring the elections are free and fair. The Returning Officer is someone selected from outside of Imperial College Union in order to ensure their independence. The Returning Officer will make the final and binding decision on any rule breaches or complex queries raised by candidates and members. The Returning Officer for the Leadership Elections 2019 is Keith Rowland, Deputy Director of Engagement at Essex University. The Returning Officer appoints two Deputy Returning Officers, members of Imperial College Union staff, to operate the elections on a day-to-day basis, answer queries from candidates and voters, and make rulings on complaints and rule breaches. The Deputy Returning Officers are Fran Hyatt (Education & Welfare Manager) and Iain Pullar (Student Activities Manager). The Returning and Deputy Returning Officers can be contacted on elections@imperial.ac.uk. If you have spent no money on your campaign, please simply send an email telling us your expenditure was zero. 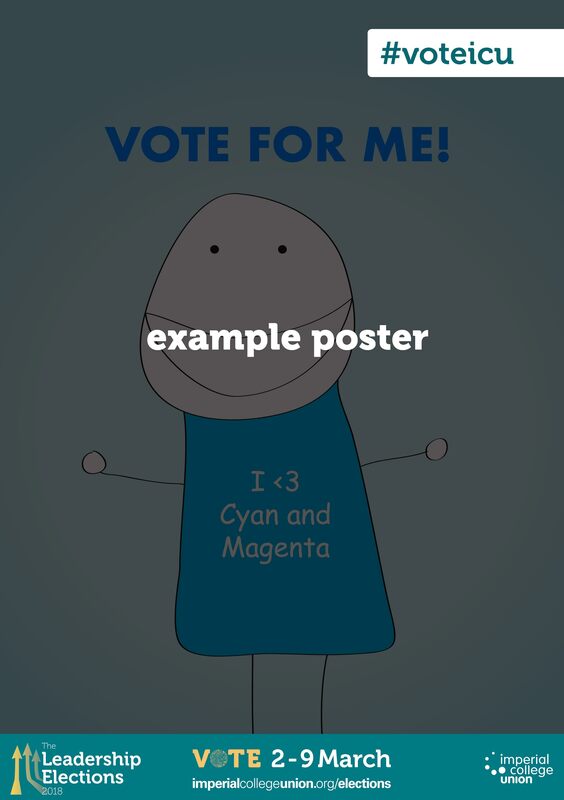 All promotional material created by candidates - such as posters or websites - must include the publicity banner and hashtag, which saves you the task of adding basic information such as the voting period, hashtag and website. Please align the hashtag to the top right of your poster. Breaches of the campaign rules are taken very seriously to ensure the elections are fair. If you would like to make a complaint about the conduct of anyone involved in the Leadership Elections 2019, you will need to complete the online complaints form.